This is the true story of a Londoner who gives up his job as an estate agent in the city, moves to the wilds of Exmoor, starts a smallholding and becomes self-sufficient, with a few bumps along the way. Simon's journey from urbanite to self-sufficient smallholder is brimming with incidents - some funny and some tragic - leading him to question Mother Nature, himself, the food he eats, and his role in it all. Which makes the transition from city life to self-sufficient smallholder slow, emotional and, for him, often confusing, but it is also beautiful, warming and laugh-out-loud funny. 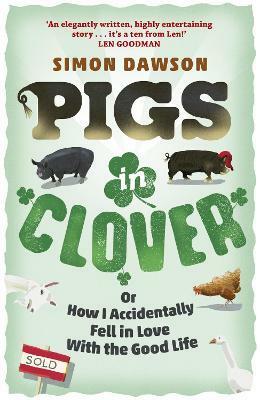 So if you would like to spend time with an accidental smallholder who completely changed one drunken night in Devon, then join Simon, his wife and their extended family as they learn the truth of what it takes to live a self-sufficient life, before eventually becoming as happy as the proverbial pigs in clover. Simon Dawson gave up his job as an estate agent in London and moved to Exmoor with his wife Debbie over a decade ago. He runs courses on smallholding, butchery, food processing and nose-to-tail eating and came first for the South West on TV's LOCAL FOOD HEROES in 2007. He is much in demand as a journalist and broadcaster, as well as being midwife and foster dad to countless pigs, sheep, goats, chickens, dogs and horses.